The 2000s was a time of trial and tribulation for many in the world, especially those living in the great old U.S. of A: the economy was on a constant state of fluctuation, we had the greatest tragedy befall our lifetimes within the first two years, we had another war on our hands, our greatest cities were ravaged by mother nature at a force we’d never seen before, and our automotive manufacturers were put in the worst spotlight they’d had since the 1970s. However, the 2000s did have a lot of great moments, and one of the biggest came from those aforementioned, troublesome manufacturers, who finally got the guts to bring back the heyday of the mid-20th century that made a lot of them what they were at the time. Even though the entire world was at our neck, we bellowed out with the deepest voice, “WE WILL NOT GO QUIETLY INTO THIS DARK NIGHT,” and as a big middle finger to the face of adversity, brought back one of our greatest exports of all time: the muscle car. Sure, some of these cars were over-glorified and over-simplified compared to their competitors. Sure, some of them were as crap as they ever could have been. But, they stood for what makes this country great: just not giving a f**k. So, let’s look at the timeline of just how we managed to build ourselves back up and how we Made America Great Again...long before 2016. When the century turned, things were rather modest in terms of American performance cars. Chevrolet had the Corvette and Dodge had the Viper, which churned out respective numbers, even in comparison to the best of Europe and Asia, but a only a certain type of customer would have chosen the American alternative over any rival from a different country, the former of which were mostly seen as antiquated and cheap in comparison. All that being said, three of the classics still remained on the roads. Two years prior, GM’s F-Body twins, the Chevrolet Camaro and Pontiac Firebird, had received massive mid-generation facelifts, with the Camaro gaining its famous, “catfish,” moniker, while the Firebird received a more muscular look, most evident on its top trim Trans Am with the WS6 package. The power outputs for the F-Body twins ranged from 310-325 bhp between their top trim Z/28, SS, and Trans Am models. However, the unfortunate crux for the two was their outdated platform, an updated variant of an old chassis introduced back in the 1980s. They were fast, but couldn’t handle quite like the imports could. Nevertheless, they still remained moderately solid sellers, but their days were sadly numbered. 2000 marked the second year of production for the recently updated Ford Mustang, dubbed the, “New Edge,” bodystyle. The Mustang had no fears in the market, due to its image of old-fashioned freedom and classic Americana which stemmed from its 1960s introduction as a classic American icon, meaning sales remained as solid as ever. The basic GT model, sporting Ford’s 4.6 liter V8, was rated at 260 bhp, a modest number in comparison to its rivals from GM, but Ford had other tricks up its sleeve. In 1999, Ford introduced the New Edge SVT Cobra alongside the regular Mustang. The Cobra had kept itself a firm reminder of the muscle car glory days throughout the past ten years, and with a 320 bhp engine, it was definitely no slouch. Still, yet, the Cobra was not the 2000 Mustang’s final form. 2000 was the one year of production for what would be eventually dubbed the “ultimate” fourth generation Mustang. The Cobra R was a shining example of what could happen if Ford put their heads together and make the Mustang a rowdy, track-pleasing car, with a more lightweight build and far more powerful 385 bhp engine. The Cobra R set out to break records, which it did achieve, and became a powerful force in the world of performance for that one year. Ford was not just putting the power down in their most famous machine, however, as they had also just introduced a high-performance variant of their F150 known as the SVT Lightning in 1999. The Lightning, colloquially known as a “muscle truck,” featured a supercharged 5.4 liter V8, producing 360 bhp, as well as a sport-tuned suspension for better road handling. Things remained rather steady for 2001 in the world of muscle cars. The Camaro and Firebird remained in production with little to no changes, but suffered their lowest sales year for their respective generations. Ford, however, did have a few surprises for the crowd in 2001. In 2001, Ford decided to introduce a somewhat odd, but much welcomed Bullitt edition of the Mustang. The Bullitt, named after the 1968 film starring Steve McQueen, was a stylized homage to the Mustang driven by McQueen’s character in the film, a car that went on to be included in what many considered to be the finest car chase of all time. This special Mustang received a 15 bhp boost to the engine, lowered suspension, subframe connectors Tokico shocks, and brakes from the Cobra. The car was available in Dark Highland Green (the color from the star car), True Blue, and Black, and was a modest success with old-school Mustang fans. Ford also added a few updates to the F150 Lightning, including a slightly retuned engine to up power to 380 bhp, as well as minor troubleshooting fixes. 2002 was an unfortunate year for the muscle car, as it saw the end to two of its longest-running torch-bearers: the GM F-Body twins were discontinued in their current form that year. Both models received a final edition model, dubbed the “35th anniversary” to coincide with the models’ 1967 introduction, with special paint and livery and optioning. To many, the return of the Camaro and Firebird seemed uncertain at that point, but many rest assured they went out with their most prominent selves we had seen for a long, long time. 2003 was a year that managed to be all about Ford, as they, now facing the muscle market a man alone, managed to pump out two new high-performance versions of the Mustang two please the crowd. The first addition was the all-new Mustang Mach 1, a name which hadn’t been used on a Mustang since 1978 on the controversial Mustang II. The new Mach 1, however, went back to its original roots in the late 60s as one of the finest Mustang packages. This 2003-2004 exclusive model, created after the wide praise of the aforementioned 2001-only Bullitt, featured a 4.6L V8 formerly found in the SVT Cobra, which was tuned to a modest 305 bhp, the most powerful non-SVT Mustang thus far, as well as Bullitt-style suspension tuning. As far as appearances go, the Mach 1 was a very retro-styled version of the Mustang, featuring a classic “shaker” hood, flat black accents, and aluminum-forged retro wheels. The interior also received an old-fashioned style treatment, with retro-styled seats, instrument cluster, and gear shifter. The biggest Mustang news came with the introduction of a new SVT Cobra for 2003, dubbed the “Terminator.” The new Cobra was a milestone in terms of performance and technology for the Mustang. Under the hood sat a brand-new supercharged version of the 4.6L V8, producing 390 bhp through a six-speed manual transmission. A 3.55:1 rear axle ratio and stronger 31-spline halfshafts with revised upper and lower control arms were added to the already-proven New Edge Cobra platform, making the ride and handling much tighter than before. These additions managed to make the 2003 Cobra one of the fastest and best-handling Mustangs to that point, with a top speed of up to 180 mph with the limiter removed. One of the most surprising additions to the muscle car world for 2003 actually came from Ford’s premium brand, Mercury, who introduced their Grand Marquis-based Marauder sedan that year for a limited production run. The Marauder was a humongous love note to the optioned out, big block V8 sedans of the muscle car era, sporting a monochrome appearance package, adding a certain attitude and flavor to the overall machine. The special edition model utilized a tuned version of the base Grand Marquis’s 4.6L V8, pushing out 302 bhp, and also received suspension and braking upgrades from the Ford Crown Victoria Police Interceptor, with which the Marauder shares a platform. The Marauder was produced for 2003 and 2004, with the company building a grand total of 11,000 models, a number which sadly fell short of corporate expectations. Meanwhile, looming in the background, Chevrolet also began production of its own line of muscle trucks, beginning with the Silverado SS, launched in the early 2003 model year. The SS sported the Silverado’s all-new mid-cycle refresh for the 2003 models, as well as a monochrome appearance on top of that. Underneath the skin, it utilized the all-new Vortec MAX 6.0L V8, pushing 345 bhp to all four wheels (and the rear wheels in later years), with modest suspension tuning to boot. While not as fast as its competitor, the F150 Lightning, the Silverado SS still showed that GM wasn’t quite ready to drop out of the game just yet. Much like 1964 did 40 years prior, 2004 was a year that showed off just how hot the muscle car race was beginning to be. Although the fourth generation of Mustang, the Ford F150 Lightning, and the Mercury Marauder were meeting their ends, other brands were finally starting to step in and make their mark on the rising market. Although the Firebird had met its match, Pontiac refused to sit out the new muscle car wars, especially considering they were one of the brands that got the original ball rolling back in the 1960s. In 2004, they introduced two new performance-oriented, V8-powered cars, one of which was the Bonneville GXP, shown above. Much like the Marauder, the Bonneville GXP was a spiritual continuation of Pontiac’s high-performance full-size sedans of the heyday such as the original Bonneville and Catalina. The GXP featured a 275 bhp 4.6L Northstar V8 borrowed from Cadillac, as well as a more luxuriously-appointed interior. Pontiac’s biggest announcement for 2004, however, was the return of the GTO, a much beloved nameplate from the 1960s and 1970s. The new GTO was a rebadged version of Australia’s popular Holden Monaro coupe, which meant that contrary to most American-engineered muscle cars, the GTO was a tad more refined in some areas regarding handling and appointments. The power came from a 5.7L Corvette-derived V8, pushing 350 bhp to the rear wheels through a manual transmission, with the engine being upgraded to a 6.0L unit in the following years. While the new GTO wasn’t the biggest sales success, it did gain a massive cult following, and just as its predecessor did 40 years before, showcased the beginning of a new era for the muscle car. 2004 also marked the return of another old face to the game: Dodge, but they didn’t come fighting with an old-fashioned Hemi-powered monster quite yet. In fact, they came with Viper power in the means of the all-new Ram SRT-10. As previously mentioned, this ultimate muscle truck sported a V10 from the popular Viper supercar, good for 500 bhp. The suspension received parts from the Heavy Duty Ram, including independent front suspension and rack and pinion steering, to make handling match that of its fire-breathing powerplant. While the world got re-acquainted with old friends, newcomers also managed to make their way in the game. During the early-2000s Cadillac was on its way with a new-found renaissance of its image, moving away from the land-yacht image of the 20th century to a serious performance brand for the 21st. This was no more evident with its newest model, the CTS, which received a performance model known as the CTS-V in 2004. The V debuted with a Corvette-derived V8 good for 400 bhp and a majorly-reworked track-ready suspension, with stiffer springs and bigger brakes. The serious stature of the CTS-V not only left American rivals in the dust, it managed to go toe-to-toe with some from overseas, making a humongous mark on the world-famous Nurburgring Nordschleife in Germany. 2005 was yet another big year for the 21st century Muscle race, which was, frankly, now in full swing. Pontiac decided to add yet another V8-powered sedan to its lineup in the guise of the all-new Grand Prix GXP which debuted in late 2005. The Grand Prix GXP, similar to its bigger brother, the Bonneville GXP, was a higher-end variant of the already existing Grand Prix, powered by a 5.3L small-block V8, pushing 302 bhp to the front wheels. The GXP also benefitted from a host of new technologies, including a four-speed automatic transmission with “TAPShift” paddle-shifting, a heads-up display, advanced suspension tuning and stability control technologies through GM’s Stabilitrak system. The Chrysler Corporation also came out swinging for 2005 with the return of one of their many storied nameplates: “Hemi.” Although the new generation of Hemi V8s dated back to 2002 with the latest Dodge Ram pickup, the first iteration of passenger cars that received Hemi power did not come until the 2005 model year. One of the biggest news was the return of the Dodge Charger, one of the most fierce muscle weapons of the late 1960s. Although the new Charger was a 4-door sedan, the basic Charger R/T still had power provided from a 5.7L Hemi V8, pushing 340 bhp in standard form, and 350 bhp with the Road/Track Performance Group package. Power was delivered to the rear wheels, making it the first rear-wheel drive Dodge sedan since over 20 years prior. However, Dodge didn’t stop at just a basic Charger R/T. Alongside the basic model also came the Charger SRT-8, a more high-performance oriented version versus the former. The SRT-8, named so for its tuning by Chrysler’s Street and Racing Technology subsidiary, received power from a new 6.1L Hemi V8, good for 425 bhp, mated to a Mercedes-derived 5-speed automatic transmission, with the addition of Brembo brakes for added stopping power. This combination made for the most powerful Chrysler-built V8-powered car ever made up to that point, with overall power and top speed beating that of its 1960s predecessors. The new Charger shared its platform alongside a new Chrysler sedan, known as the 300, which also debuted in 2005. The 300 was a spiritual successor to the popular Chrysler full-size sedans of the 1950s, some of which were known as the genesis of the muscle car wars due to their high-powered Hemi V8 powerplants. The top trim 300C shared its 5.7L Hemi V8 with the basic Charger R/T, while the 300C SRT-8 received the same tuning and power as the Charger SRT-8, all with a more luxuriously appointed interior and exterior. Quite possibly the most exciting news for 2005 was the introduction of Ford’s all-new Mustang. The fifth generation Mustang was a huge departure from its immediate predecessor in terms of styling and engineering as the overall attitude of the new car put a huge dent in the rest of the competition, truly showing the world that the muscle car race was back. The new Mustang featured styling that was heavily themed and inspired by its 1960s counterpart, becoming the first of the fully retro-styled muscle cars to be introduced. The 2005 Mustang received power from an all-aluminum 4.6L V8, bringing a well-rounded 300 bhp to the rear wheels through the buyer’s choice of a five-speed automatic or manual transmission. The GT featured a limited-slip differential with a lightweight live-axle rear suspension, a feature that garnered much criticism. Nevertheless, the Mustang brought forth much great press and was an immediate hit across the board, once again putting the Mustang at the top of the game in terms of popularity. 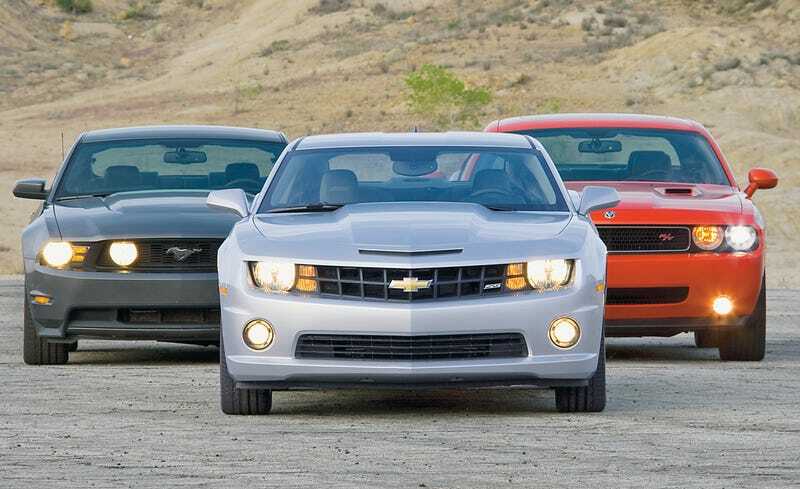 2006 was the third and final year during the decade where the most new cars were introduced to the muscle car market. Ford remained rather dormant, still reeling off of the introduction of the new Mustang in 2005, but GM and Chrysler took the initiative to introduce a couple of new models and special editions to spice up their lines. After the humongous success of the 2004 CTS-V, Cadillac decided to expand their new V performance lineup with two new models for 2006: the STS-V and XLR-V. The STS-V, which was a high-performance midsize sedan designed to combat the likes of the BMW M5 and Mercedes-Benz E63, was powered by a supercharged version of Cadillac’s Northstar V8, bored to 4.4L and producing 469 bhp to the rear wheels. The impressive power meant that the STS-V was the most powerful V8-powered production car GM had built at the time. The STS-V also benefitted from a fully independent suspension, heavily stiffened in comparison to the stock STS, with faster steering ratios and bigger Brembo brakes. The XLR-V was a slight departure from the usual Cadillac formula, as it was designed primarily as a luxurious grand touring roadster rather than a plush luxury sedan. The V variant used the same supercharged Northstar V8 of the STS-V, with 449 bhp versus the former’s 469. The XLR-V utilized bigger brakes from its platform mate, the Corvette, with a largely untouched suspension tune. At the time of its introduction, the XLR-V was one of the most expensive models on sale from GM, priced at about $110,000. Chevrolet also slowly began peeking back into the market starting in 2006 with the introduction of the all-new Impala SS. The new Impala SS was the first car to wear the nameplate in ten years that also utilized V8 propulsion, through the means of the 5.3L V8 from the aforementioned Pontiac Grand Prix GXP. The V8 powerplant was the main selling point of this new Impala, however, as suspension was hardly changed from its regular counterparts, but the interior was much more plush in comparison, with leather-trimmed seats and more standard features, making it the highest trim level available for the Impala. The Impala SS shared much of its running gear and platform with the Monte Carlo SS, which was also introduced in 2006. The new Monte Carlo was more of a slight refresh over its previous version, with a new exterior and interior reworking, and, of course, power coming from the 5.3L V8. A new variant of the muscle car showed itself in 2006, known simply as the muscle SUVs, an American take on the popular performance SUVs of Germany such as the Mercedes-Benz ML55 and G55 AMGs. The first of two to be introduced was Chevrolet’s own TrailBlazer SS. The SS was provided with a 6.0L Corvette-derived V8, pushing 400 bhp to the wheels through a four-speed automatic transmission, a stiffer suspension, and an auto-leveling air ride system for the rear. Chrysler also brought their own performance SUV to the party in the guise of the Jeep Grand Cherokee SRT-8, a 6.1L Hemi-powered version of the already popular Grand Cherokee. Obviously sporting the same 425 bhp powerband as the Charger and 300C SRT-8 models, the Grand Cherokee benefitted from Bilstein gas-charged shocks, stiffer suspension, a 5-speed automatic transmission, and a specially designed all-wheel drive system as standard. This spicy recipe made the Grand Cherokee SRT-8 one of the fastest SRT-designed cars in the day, second only to the mighty Viper, with recorded 0-60 times of 4.6 seconds. For 2006, Dodge also introduced a slightly odd SRT car in comparison to the rest: the Magnum SRT-8, based off of their Charger-based Magnum station wagon. The Magnum, much like its Charger brother, also got power from the 6.1L Hemi V8, as well as an upgraded 5-speed automatic in comparison to the regular Magnum’s 4-speed. For 2006, Dodge also introduced a new version of the non-SRT Charger, reviving a nameplate not seen since 1969: Daytona. The new Charger R/T Daytona was a slightly tuned version of the regular R/T, featuring special paint, suspension, and body modifications, as well as the Charger R/T’s high performance Road/Track version of the 5.7L Hemi with 350 bhp. Post-2006, things started to wildly slow down for the new era of the Muscle car, as the world seemed to loom on the threat of a huge economic breakdown and some people didn’t seem keen for newer muscle cars. 2007 still showcased a few new introductions to the market, though they were mostly in the guise of special editions or other packages rather than completely new models. Chrysler remained largely quiet for 2007. The year marked the end of the big brute known as the Ram SRT-10, and along with the death of the Silverado SS, meant that muscle trucks were all but dead. Dodge did, however, introduce a new package for the Charger SRT-8, reviving the SuperBee name. The package was none more than a special paint and livery package, with only 1000 being produced in Detonator Yellow for 2007, with other colors being offered in limited numbers in the following years. Ford, however, did have big news for 2007, with the release of the highly awaited SVT-tuned version of the new Mustang. Instead of wearing the “SVT Cobra” moniker of years before, the new model wore the “Shelby GT500" name, not seen since 1970. The new GT500 was the most powerful Mustang built to that point, with a supercharged 5.4L V8, similar to that of the Ford F150 Lightning and GT supercar. The engine was good for 500 bhp, mated to a GT500-exclusive 6-speed manual transmission, but received very little in terms of suspension upgrades. Nevertheless, the new GT500 managed to overcome its handicap when tested on many tracks, surprising journalists with quicker laptimes than many imported rivals. For those less-inclined to pony up for the full-blown GT500, Ford also introduced a detuned Shelby GT version of the Mustang. The Shelby GT featured a tuned version of the standard Mustang GT’s engine, upping horsepower to 320, as well as slight body modifications for a more classically aggressive appearance. Compared to 2007, 2008 largely seemed like business as usual, as we got a few new models on the lots and a few new packages to boot, keeping things interesting in the market before things took a humongous downturn for the industry in years prior. After taking a minor break for 2007 in terms of performance models, GM returned for 2008 with the most surprising addition to the game: two new V8-powered performance cars from Buick of all brands. While Buick was by no means unfamiliar to the muscle and performance game, having introduced classics such as the Grand Sport and GNX in decades prior, they had largely become a face for plush semi-luxury in the years leading up to 2008. That didn’t stop GM’s performance division from tinkering with Buick’s LaCrosse and Lucerne sedans to create the new Buick Super line for 2008. The LaCrosse Super utilized the 5.3L V8 found in the Grand Prix GXP and Impala SS, as well as slight suspension tuning with Magnasteer and Stabilitrak. The Lucerne on the other hand was produced with a slightly softer outlook. While it used a more powerful version of the 4.6L Cadillac Northstar V8 found in the basic Lucerne, it did not receive the suspension upgrades found in the LaCrosse. Neither of the Buick Supers made much of a splash in the market, but were seen as bold experiments on the part of GM to introduce some pizazz to a rather plain brand. Another surprising introduction came from Pontiac, with their new G8 sedan. Based on the Australian Holden Commodore sedan, the G8 was a rear-wheel drive sedan that acted as a torch-bearer from the previously mentioned Bonneville, GTO, and soon to be discontinued Grand Prix. The top-trim G8 GT featured a 6.0L V8, providing 361 bhp through a 6-speed automatic transmission. The G8 was the first rear-wheel drive sedan produced by Pontiac since the 1980s, and showcased the possibility that Pontiac may have finally gotten their groove back as GM’s performance oriented brand. For 2008, Ford also continued diversifying the Mustang lineup with an all-new Bullitt package for the 40th anniversary of the original film. The new Bullitt, similar to the 2001 model, was styled highly to mimic the Mustang used within the film, lacking front and fender badges and a rear spoiler. Based upon the GT, the Bullitt featured a slight power bump to 315 bhp, a heavy duty rear axle and higher RPM redline, and a new exhaust system designed to mimic that of the original star car’s distinctive note. The Bullitt was offered for 2008 only in Dark Highland Green and Black, and remains a collector’s item to this day. 2008 also marked the introduction of a more extreme version of the Shelby GT500, known as the GT500KR, mimicking the original KR introduced in 1968. Limited to just over 1000 production units for 2008, the KR was tuned versus the regular GT500, producing a new robust number of 540 bhp. It also received new suspension tuning, including a new strut tower brace and tuned springs and shocks to fix some of the common complaints from drivers of the standard GT500. The final product ended up weighing in just lighter of that of the standard car, making handling and performance much easier in comparison. Just like the Mustang did in 2005, the biggest announcement that swept the world was the introduction of Dodge’s new Challenger revival for 2008, a new design that had been on the floor since the 2006 Challenger concept. The new Challenger shared its platform with the Charger, meaning that the standard R/T was powered by the 5.7L Hemi, and the upgraded SRT used the 6.1L unit. It was the second muscle car introduced after the Mustang to be heavily retro-styled, which garnered much attention and praise from critics and buyers alike. In fact, audiences were so enamored by the new car that all 6,400 units to be built in 2008 were pre-sold before the car even went on sale. 2009 could be seen as the darkest year for the new muscle car war since 2002, as barely any new models were introduced for this year. The recession was now in full swing, and people were rarely interested at all in high performance cars. The American auto industry was being highly scrutinized by the government for poor performance and interest in Earth-saving technology. The entirety of the country was looking towards a bit of a revitalization period, and yet, we still got two major performance introductions for the year. “Pontiac’s last hurrah” was the common term used for the all-new G8 GXP, introduced for 2009. The GXP was an American-centered version of Holden’s popular HSV-tuned Commodores, featuring a new 415 bhp version of the GT’s V8, and a Nurburgring-tuned suspension for tighter cornering and higher speeds. However, the party was short lived, as GM announced the closure of Pontiac as a whole by 2010. In total, only 1,829 GXPs were built and sold in the US, and America lost one of its longest-running brands, and a fantastic sports sedan in the process. Somehow, 2009 also provided Cadillac the opportunity to release the newest CTS-V, a car which became one of the biggest hits for the early 2010s. The new CTS-V technically broke free of the muscle car reign, as its 556 bhp supercharged V8 and Nurburgring engineered suspension made it the fastest performance sedan in the world at the time, breaking the record at the Ring for the fastest sedan overall. 2009 was certainly a dark year, we lost many fan-favorites, and some generations came to a close. But not all was lost. In fact, 2010 marked a slight resurgence in the name of the muscle car. In 2006, Chevrolet introduced a Camaro concept that utilized styling elements from the original 1967 Camaro, but it wasn’t until 2010 that that dream became a reality. The all-new 2010 Camaro was a humongous leap in terms of power, technology, and performance in comparison to its 2002 predecessor, and even its competitors today. Under the hood of the SS version sat a 6.2L V8, pushing 400-426 bhp depending on your choice of automatic or manual transmission. The suspension underneath borrowed technology from Holden, meaning it used a four-wheel independent set-up with four-wheel disc brakes and a StabiliTrak system. This meant that the new Camaro was one of the best performing and handling muscle cars of all time, leading some to believe it belonged to the classification of a full-blown sports car. Nevertheless, the new Camaro was a massive hit from its debut, almost matching its main rival in terms of sales and popularity. Speaking of said rival, a new Mustang was also introduced in 2010, featuring a slightly restyled exterior that mimicked the 1969-1970 Mustangs of yore. While most of the chassis was left unchanged, it featured new spring rates and dampers to improve quality and control, as well as a bump in power from 300 to 315 for the GT’s stock V8. Much like the regular Mustang GT, the updated 2010 Shelby GT500 receive only minor exterior and power updates. While the GT500KR was gone, the new GT500 matched its power with a new version of the old GT500's engine. The new GT500 also utilized an updated version of the 6-speed manual transmission from the old car, with larger clutch disks making for increased fuel efficiency versus the previous model. I could easily continue going on about the rest of the 2010s and how we’ve seen much more powerful and much more impressive models since then, but honestly, I feel like the 2000s was the most intense heat of the muscle car wars since the original ones in the 1960s. It started out bleak and uninteresting, got extremely hot somewhere in the middle, and fizzled out once again near the end until the new decade took over and we got ourselves back together again. Sure, there were other decades such as the 80s and even the 90s that sort of had similar things going on, but having experienced the 2000s firsthand, nothing beat that sheer exhilaration of wondering what company would do what next. And while today, we sit with the most powerful, best handling, and most impressive variants of the big three muscle cars, nothing will beat the quick moment where nearly every brand had multiple versions on the market, one for every style and type of driver. They may not have been the best cars, and it’s understandable to prefer the imports, but I think in the end, America just didn’t care. We just wanted you to know we were here, and were were ready to fight. God bless America.